People do trust credit unions a lot more than banks, especially large banking companies, according to a “trust index” tracked by the University of Chicago and Northwestern University’s business schools. Two-thirds of Americans trust credit unions, the index showed recently, while only one in four trust a major bank. 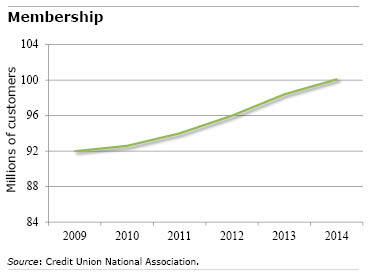 There can be financial gains to joining a credit union. Various studies, supported by the credit union industry but carried out by academic researchers, show they charge less for loans and pay more on deposit accounts. In one study based on large surveys of U.S. financial institutions by an Auburn University finance professor, credit unions charge 1.26 percentage points less in interest for a 5-year car loan than do large banks. Credit union customers also pay less for equity lines of credit, but long-term mortgage rates are similar among institutions. Credit unions pay more to customers who deposit their money with them, though this advantage doesn’t add up to much at a time when certificate of deposit and savings-passbook rates across all institutions are at historic lows. More people seem to be getting in on the secret. Of course they can use marketing any way they wished, however, they have to market memberships. What difference is that to, for example, certain frequent flyer associations, etc.? The very reason that they’re different is the membership aspect. The problem, from my research is that people tend to think that this is the only thing they offer. People are not aware that either singly or through “banding together” and via agreements with other normal providers that credit unions offer practically all a “normal” bank offers, only: they never change their risk profile as banks do (one day they open the flood gates, the next day they are tight-walleted).